Have you ever heard the saying “a little dab will do you”? Well, that’s exactly the case when using essential oils. Wouldn’t you love it if your horse was more relaxed when being trailered and calm during those “scary” trail rides and shows? Wouldn’t you love something that can reduce pain and inflammation when your horse (or dog or YOU) suffers an injury? Well, essential oils can do just that. What are they and where do they come from? Essential oils are natural compounds derived from seeds, bark, stems, roots, flowers and other parts of plants. 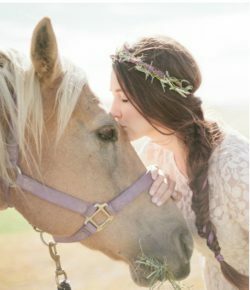 Very Horse Hippie! The oils give plants their distinctive smells and aid in pollination. Essential oils have been used for thousands of years and today are used for massage, alternative medical therapies, beauty applications and well-being. They are typically used topically, aromatically or internally. Why should I use Essential Oils on my Horse? Non toxic to the horse– Just like the human body, toxicity is a huge problem for our animals. Easy to use– Horses can inhale the oil directly from the bottle or from your hand. They can be placed directly on the body or placed in their feed. Extremely beneficial for helping horses stay calm and focused- The oils are another tool for the tool box when you are working with horses. Essential oils work best in combinations of three to five different oils. This is due to nature’s synergy that is created, making “the whole greater than the sum of its parts.” It’s important that the oils are carefully blended and proper dilution is very important so they are safe to use on a daily basis and over the long term. There is always a carrier oils used with the essential oil. Organic is best, like Sweet Almond, Olive, Jojoba, Coconut, Fractionated Coconut, etc. to dilute the oil. It’s best to have your horse smell the oil first. Then, place a drop or two of oil on the forehead, the crest of the neck by the mane or at the poll as well. Essential oils can quickly penetrate the tissues of the skin, and from there diffuse throughout the body in the blood and tissues. Takes just 2-3 sec for oil to reach bloodstream when used topically. Takes 20 min for an oil to reach every cell in the body. This is a powerful and effective way to use oils! Remember every horse is different so some oils will work on your horse and others might not. Be sue to experiment with a variety of oils before you decide they “don’t work”. Yes, they are very safe. Unfortunately however, in the United States there are not standards for testing therapeutic grade essential oil and the FDA has very loose standards on even labeling oils. Therefore it is very important to get your oils from a reliable source. We searched and researched several essential oil companies and loved what we discovered about Well Scents. Cheryl, the creator of the blends we offer, impressed us with her dedication to offering quality products that work. What if my horse is allergic? Allergic reactions are caused by the “histamine”, a protein molecule. Essential oils do not contain protein, so an allergic reaction is not possible! Redness normally indicates a detoxification reaction not an allergy reaction. With that said remember that essential oils do not substitute for professional medical advice and treatment whether it’s for you or your pet. Sweet Almond Oil is one of the most common oils to use in combination with others. It comes from the almonds that we like to eat. The oil is a medium light oil that’s an excellent lubricant and beneficial for dry sensitive skin. It is rich in proteins, vitamins and minerals. Bergamot looks like a miniature orange and the oil is from the peel of a nearly ripe fruit. It’s fresh smelling and a favorite used in aromatherapy. It is used in the flavoring of Earl Grey Tea which is the most recognized flavored teas in the world. It’s also recognized for its scent, which is citrus. It’s used for calming, depression and gives us a relaxed happy feeling. Chamomile, Roman is a member of the daisy family and grows freely in pastures, cornfields and roadsides. It gives off a pleasant apple scent and is best used for tension and nervous conditions. It can be helpful for both your horse and YOU before competing but won’t adversely affect the performance. A bunch of the flowers hanging in the barn is said to help deter flies. Chamomile, German is also from the daisy family but its chemistry make-up makes it better for anti-inflammatory. Externally, it can be used in a liquid form to wounds, bruises and skin irritations. Its active ingredients make it more potent than the Roman. Cistus which is commonly referred to as Rose of Sharon and Rock Rose. It has a fruity smell with strong honey overtones. It was first noticed by shepherds thousands of years ago. An oldie but goody, as the saying goes. It calms and relaxes. It’s also very uplifting and stimulates all 5 senses. Clary Sage is a clear to pale essential oil that has an aromatic mint smell. The benefits are calming to the nervous system, particularly in cases of depression, stress, insomnia and tension. Clary Sage blends well with Juniper, Lavender, Geranium, Jasmine and Frankincense. Speaking of Frankincense, it originates from the Middle East and is a tree or shrub that produces a gum or resin type substance with huge benefits. It can help build and maintain a healthy immune system, reduces the appearance of scars and is calming and soothing to the skin. This oil is commonly used in prayer and meditation. Geranium It can be used as an antiseptic, an astringent and an antibiotic. It can also help to balance your mind and emotions. It can be a mosquito repellent due to its strong smell. Juniper is distilled from the berries and needles of the juniper plant. The berries take a full THREE years to ripen to maturity. The smell is similar to the juniper shrubs in yard landscaping. It’s a natural cleansing and detoxifying agent and it helps to relieve tension and stress. It is especially useful for healing from trauma or pain that we don’t want to face. Lavender is familiar to all of us. I think of soothing and peaceful, getting a massage and soaking in a bath tub! Its qualities are calming, relaxing and stress reducing. It’s excellent for migraines and can also be used for sun burns, insect bites and burns. Marjoram, Sweet is considered the herb of happiness and the Greeks and Romans dedicated it to Aphrodite, the Goddess of Love and Beauty. It is a member of the Thyme family and is highly aromatic. It’s warm, soothing action brings almost instant relief to all muscle and joint conditions. It is an effective relaxant and definitely sounds like my kind of oil! Neroli The Neroli tree was brought to St. Augustine Florida by the Spaniards in the 1700s which is why Florida is one of the largest producers of oranges. The essential oil comes from the orange peel. It’s valued for its calming and relaxing scent which acts like a tranquilizer that can help alleviate anxiety and treat stress related depression. When used topically, this oil works as an antidepressant that has a soothing and calming effect on your mind and body. Peppermint is a cross between a watermint and spearmint. It may be the most versatile essential oil in the world along with lavender. There are few body, health and mind uses it cannot help! The oil gives a cooling sensation and has a calming effect on the body. When used topically, it can relieve sore muscles. The most common benefits include reducing stomach aches, soothe digestive issues, improve mental focus and boosts energy. Valerian’s root has been used for thousands of years for its calming, grounding and emotionally balancing influence. For these reasons, it is perfect for restlessness and controlling pain. It is commonly used for dogs to control pain and reduce stress. It’s important to note that it is very toxic to cats. Vetiver essential oil has an earthy and grounding aroma and can be diffused for its calming and relaxing fragrance. It is excellent when a person needs help maintaining emotional equilibrium. It’s beneficial for those in the midst of trauma, anxiety, muscle pain and it increases blood flow to sore muscles. Yarrow is an herb that alleviates stress and treats allergies. It’s known for its sweet aroma. This oil has tremendous healing properties such as anti-inflammatory, antioxidant, antiseptic and antimicrobial. It can help with anxiety and sleep and its aroma exerts many effects which can be used for emotional healing. Soothed Horse: A Sweet Almond Oil, Essential Oils of Yarrow, Chamomile, Juniper and Peppermint blend will help soothe your horse. Relaxed Horse: A Sweet Almond Oil, Essential Oils of Chamomile, Juniper, Lavender and Neroli blend can be relaxing for your horse. Trailering Blend: A Sweet Almond Oil, Essential Oils of Valerian, Chamomile, Neroli and Vetiver blend is used to help calm your horse while trailering. Confident Horse: A Sweet Almond Oil, Essential Oils of Neroli, Bergamot, and Juniper blend that supports your horse’s assurance while relaxing him or her and reducing worries. Focused Horse: A Sweet Almond Oil, Essential Oils of Lemon, Patchouli,and Cypress blend assists your horse in maintaining his or her focus on both his or her body and immediate surroundings. Use this blend to help your horse perk up and pay attention. Relaxed Dog A blend of Sweet Almond Oil, Essential Oils of Clary Sage, Chamomile and Neroli will help a dog who, once upset or excited, become more so to the point of increasingly heightened anxiety. Calm Dog: A mixture of Sweet Almond Oil, Essential Oils of Lavender, Marjoram Sweet, Chamomile, Neroli and Geranium are for dogs who become anxious, worried, over-excited, or who cannot relax. Traveling Dog: Is blended with oils of Sweet Almond Oil, Essential Oils of Lavender, Ginger, Peppermint, Neroli, Vetiver that fight nausea, as well as support digestion – for a more comfortable ride. Stress Less: A combination of Sweet Almond Oil, Essential Oils of Lavender, Geranium, Bergamot and Vetiver in a blend that is uniquely scented with the fragrance of calming, balancing, and grounding oils that are also good for your skin. Rescue Oil: A Sweet Almond Oil, Essential Oils of Cistus, Neroli, Chamomile and Frankincense blend dropped in our bath can “rescue us” from that long day. RestFull: Is a blend of Sweet Almond Oil, Essential Oils of Frankincense, Lavender, Cistus, Sandalwood, and Neroli. Great for when you cannot relax enough to sleep, and cannot stay asleep. As you can see we are very excited about using essential oils and adding this line to our shop! We hope you will try them and let us know how they worked. To purchase any oil just click on the name and it will redirect you. Or click here for the full essential oil collection. Are there any essential oils than can dull pain? My horse recently bumped his head and he is pretty sore still. If you know of any that would be great! Thanks! What a great blog post! I very much enjoyed reading and I will most certainly return when I am in the need of some essential oils for one of my horses. Thank you for sharing your knowledge!